ninja kitten: Baby Blanket Finished! Realizing that once my baby gets here, I'd have little time to sleep, much less knit, I have been powering though knitting the baby blanket I had in the works for the last month. The design name is Sunny Cables and Crowns. If you're on Ravelry, which every knitter is nowadays, you can find out more about it. It's a beautiful finished work, sunny and bright and cotton-y for a nice summer baby. I think it might be a little bit heavy, but I asked for it when I decided to knit with cotton, even soft organic cotton such as Blue Sky Dyed Cotton. For those of you who are curious, I used the Lemonade colourway which is bright yellow, a shade more saturated in color than my living room walls. If I ever chose to knit this blanket again, which I might or might not do, I'd probably pick a smoother washable wool (or wool mixture) yarn. 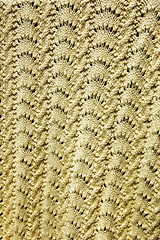 While I love the finished work, and the pattern is very visible, obviously, I think a smoother yarn would have benefited the pattern. The close-up is almost unrecognizable as a cable and fan pattern. I used seven or eight skeins, I can't remember which, and I have a single skein leftover now, which my husband desperately wants to wind into a center pull ball. 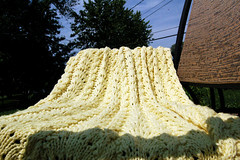 I have no idea what I plan to do with one skein of bright yellow organic cotton yarn. Sophy has a cute tassled hat pattern which uses one skein of this very yarn, but I don't think I know ANYONE who would wear a bright yellow hat. Perhaps I could make her hat pattern slightly smaller and give it to one of my beloved nieces. Anyone else have any recommendations on what to do with one skein of Blue Sky Dyed Organic Cotton yarn? Speaking of Sophy, she has been knitting a ton of baby socks recently which have been adorable. The pattern is from Interweave Knits and is totally free (so long as you register at their site). Knowing that I'd be finishing my blanket in a day or two, yesterday, I cast on for the baby socks so that I'd be prepped with a new knitting project when I was finished the blanket. I know I shouldn't overlap projects like that, and clearly the knitting gods knew it too, because my cast-on and join went perfectly so long as you ignore the fact that I wrapped my working yarn around the needles twice and now the whole thing is a mess when I attempt to knit. 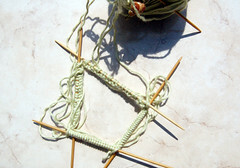 I am clearly going to have to pull my one and a half rows off the needles so that I can re-cast on. This is depressing to me, but I have nothing but time as I wait for this baby to decide labor is a GO. Also, I've discovered the world of knitting podcasts, and now, while my husband sleeps, I can sit in bed next to him knitting. This was sort of obnoxious as I was finishing the baby blanket, as I had to keep moving the heavy nearly finished blanket around, but it should be fun now that I'm working on the socks. The Podcasts I like best so far, for all you people who are curious about this type of thing, are Knit Picks and PixiePurls. Pixie Purls is a lot like me in many ways, so listening to her cheery voice talk about things I'm interested in and agree with is wonderful, but she does appear to have stopped the podcasts since the birth of her daughter. I've also been listening to LimenViolet which I find interesting but not exceptional. Christy has also recommended Lion Brand's podcast, but I have yet to give that a try, so I can't tell you whether it's good or not. I'm sure I'll be listening to it soon, however. Lastly, I thought you might be curious, but I have OTHER craft hobbies. Or one, at least. I have cross-stitching. 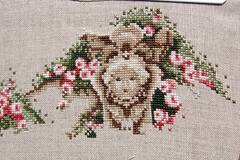 The picture above is of HOURS AND HOURS AND HOURS of work on a pattern by Mirabilia. I started cross-stitching way before I knit, even, but cross-stitch is a slow and tedious craft. The results are often kitschy and countrified too, which I don't care for anymore. Mirabilia is one of the few exceptions to that, and they have incredibly elaborate patterns, but the more elaborate, the more time it takes to make. I've worked on the piece above, off and on, since I've been married (three and a half years now) and I still haven't even gotten to the main part of the work! That's it for now. I'll have more information on how the socks are going in my next post, as well as give you some details on my one project at a time theory. That is -- if I haven't gone into labor!